I had mentioned a few posts ago that I had won a 25 pound bag of all-purpose flour. I have been baking my way through all that flour. Bread of course is one of my favorite things to make, so I have used my flour to try some new bread recipes. My family has been enjoying the fresh homemade bread, it’s always amazing when everyone sits down for a meal how fast the fresh bread disappears. My latest creation is these crescent rolls. I made them for my daughter-in-law Brianna’s birthday dinner. The rolls turned out to be soft and tender and yummy. 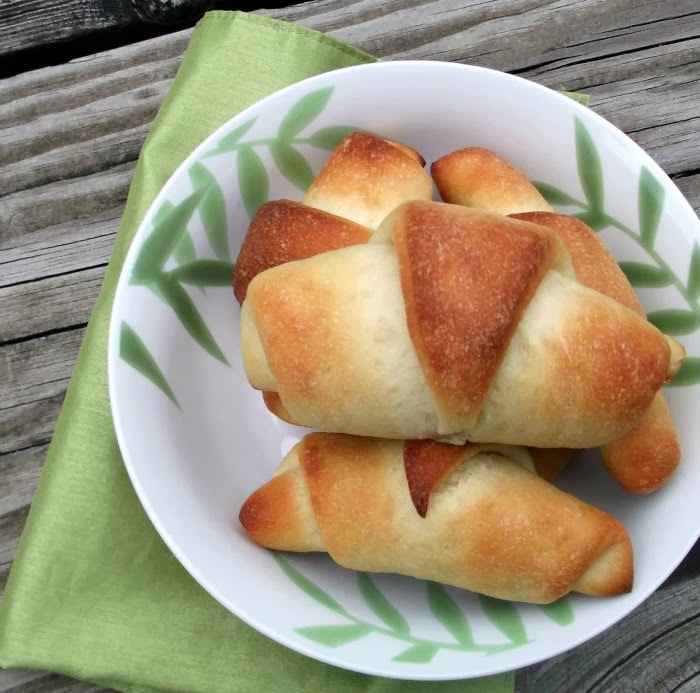 I have never made crescent rolls before, so I was surprised to see how easy these were to make. I enjoyed seeing everyone’s smiles when these were set on the dinner table. 2. Stir in sugar, salt, eggs, shortening, and 2 cups of flour. Beat until smooth. Mix in the remaining flour (I used about 3 cups of flour, the dough should stick a little bit to your fingers when kneading, you don’t want to add too much flour) by hand. Knead dough until nice and smooth. Cover dough and let rise in a warm place until double (about 1 – 1 1/2 hours). 3. Punch down dough. Divide in half. Roll each half into a 12-inch circle. Spread with butter. Cut into 10 to 15 even wedges. Roll up the wedges starting with the wide end. 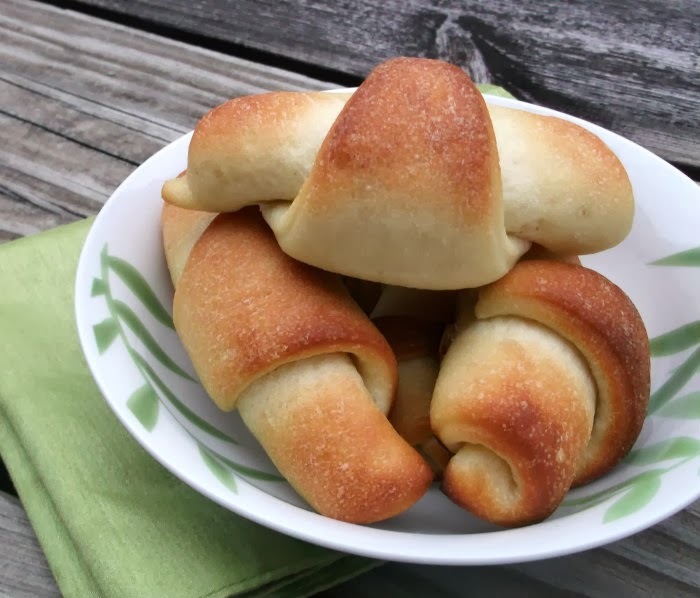 Place rolls with point under on a greased baking sheet. Cover and let rise until double (about 1 hour). 4. Bake at 400 degrees F for 12 to 15 minutes or until golden brown. Brush tops with butter when they come out of the oven. They look lovely, if I made the dough in a breadmaker , then carried on from step 3 do you think they would come out ok? Whoa! 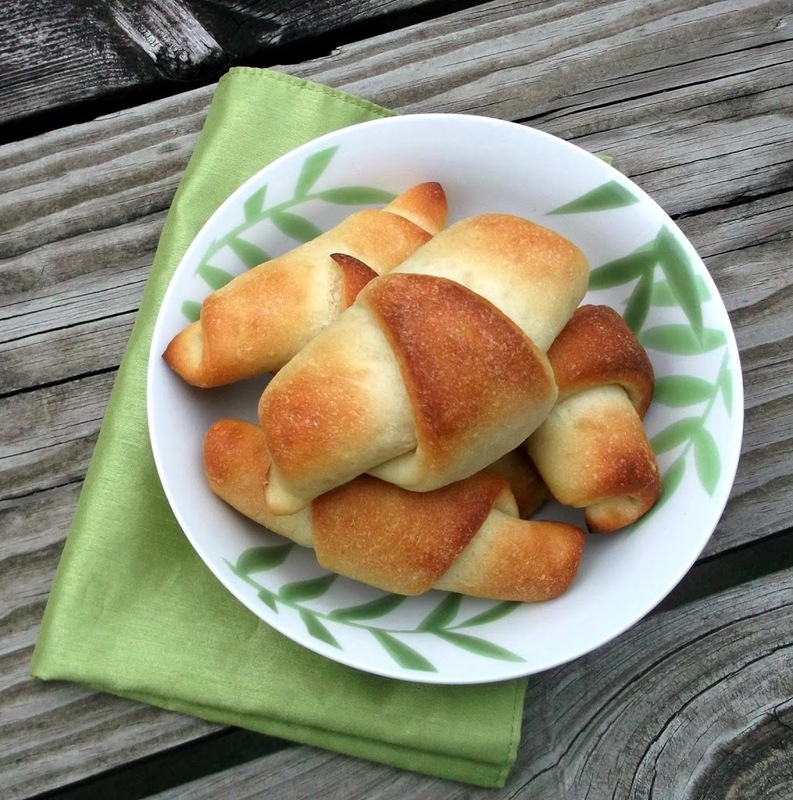 Those look JUST like the crescent rolls from a tube!! But way better because they’re homemade. Gosh, these look so great! Really pretty, and you’re right – they aren’t at all difficult to make. Gotta try these – thanks. I’m a HUGE fan of bread and homemade rolls are my favorite!